According to the latest statistics from the American Academy of Facial Plastic and Reconstructive Surgery (AAFPRS), the most popular surgical procedures in 2010 were rhinoplasty, facelift, and blepharoplasty. The most common nonsurgical cosmetic procedures were BOTOX® Cosmetic and hyaluronic acid. Regardless of the procedure, Irvine facial plastic surgeon Dr. Ali Sepehr stresses the need for an individualized treatment plan carried out by an experienced, board certified surgeon. The latest data from the American Academy of Facial Plastic and Reconstructive Surgery (AAFPRS) shows the most common surgical procedures in 2010 were rhinoplasty, facelift, and blepharoplasty. The most popular nonsurgical procedures were BOTOX® Cosmetic injections and hyaluronic acid. 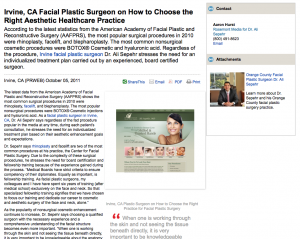 As a facial plastic surgeon in Irvine, CA, Dr. Ali Sepehr says regardless of the fad procedure popular in the media at any time, during each patient’s consultation, he stresses the need for an individualized treatment plan based on their aesthetic enhancement goals and expectations. Dr. Ali Sepehr earned his medical degree from the University of California, Los Angeles School of Medicine. He then completed his residency at the University of California, Irvine Head and Neck Surgery and Facial Plastic and Reconstructive Surgery. Dr. Sepehr also completed a fellowship at the University of Toronto Facial Plastic and Reconstructive Surgery. He is a member of the American Academy of Facial Plastic and Reconstructive Surgery, and a prolific speaker and researcher.